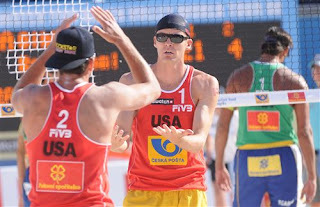 Americans Jake Gibb and Sean Rosenthal (13) showed they have gold on their mind by knocking off the FIVB tour's top-ranked team of Emanuel Rego and Ricardo Santos (2), to make FIVB Prague Open finals. Battling back to win after being down 11-13 in the third game, Gibb and Rosy battled back to win 21-17, 17-21, 18-16. The duo may have turned a new leaf with this, showing they can keep their cool, rather than tending to self-destruct under pressure as they've done in the past. The Americans will face German duo Brink-Dieckmann (11) in the finals on Sunday.